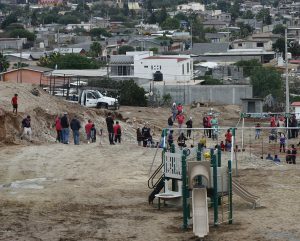 A 22-year old playground that was removed from Oak Brook Park District’s Central Park in July of 2016 has been refurbished and installed to benefit the children of Camalu, Mexico. Studies by the National Recreation and Park Association (NRPA) show that playgrounds reduce crime, increase physical activity, and fight. Outdoor play is also essential for a child’s physical, social, emotional, and cognitive development. “We are thrilled to help bring the benefits and joy of outdoor play to a community in need,” said Laure Kosey, Oak Brook Park District’s Executive Director. The park district donated the equipment to Kids Around the World. The Rockford-based nonprofit organization works to brings hope to children in impoverished areas around the globe by providing an alternative solution to recycling or disposing of used playground equipment. “The reaction of children to these playgrounds is very similar to the reaction American kids have when they see Disney for the first time,” says Dave Mogle, a volunteer for Kids Around the World. According to Oak Brook Park District Director of Parks and Planning Bob Johnson, once a playground structure is removed from its original location, it voids all manufacturer liability and makes relocating equipment cost prohibitive. The Oak Brook Park District replaced the donated structure with new ADA accessible equipment. The new playground is open from dawn to dusk and is located in Central Park, 1500 Forest Gate Road, adjacent to the park district’s natural turf soccer fields and Central Park West rental facility.